Set in the back drop of Shiwalik hills, Nahan is a beautiful hill station of Himachal Pradesh. It is known for its serene environment free from the pollution of a city. Clean and dust free street is the trademark of this city. 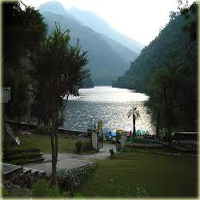 Travel to Nahan will give you an opportunity to unwind your mind and take a break from the monotonous daily life. Suketi Fossil Park, Trilokpur Temple, Dhaula Kuan are some of the attractions of the city. We are a leading Nahan Travel Guide who arranges the highly acclaimed Nahan Tour Packages. Suketi Fossil Park is the main attraction of Nahan situated 21-kms from the city. This park exhibits life size fiberglass models of pre-historic animals whose fossil and skeletons were uncovered here. The park is first of its kind in Asia. This fossil park at present has six sets of life-size models of Stegodonganesa Sivatherium, Hexaprotodon-Sivalensis, Colosschelys Atlas, Paramachaerdus and Crocodilia, the extinct animals which once thrived in the region. This temple was built by Raja Dip Prakash in year1573. It is situated at a distance of 23-kms from Nahan and 6-kms from Kalka-Ambala highway. The goddess Mahamaya Bala Sundri is enshrined in this famous temple. A fair is held twice a year during the Navratras in April and October here. Dhaula Kuan is 20-kms from Nahan, it is a sprawling orchard consisting of citrus plants and mangoes and a fruit canning factory of various kinds of juices, jams, pickles and canned fruits. The victory Raja Jagat Singh over advancing army of Rulam Quadir Rohilla is commemorated in the Devi Temple which is built a little away from Dhaula Kuan.